The 5-reel, 20-payline Gonzo’s Quest Slot Machine you join a Spanish explorer searching the ancient Incan civilization for the Lost City of Gold. The excellent quality of both the graphics and sound make this a great choice for online casino players. 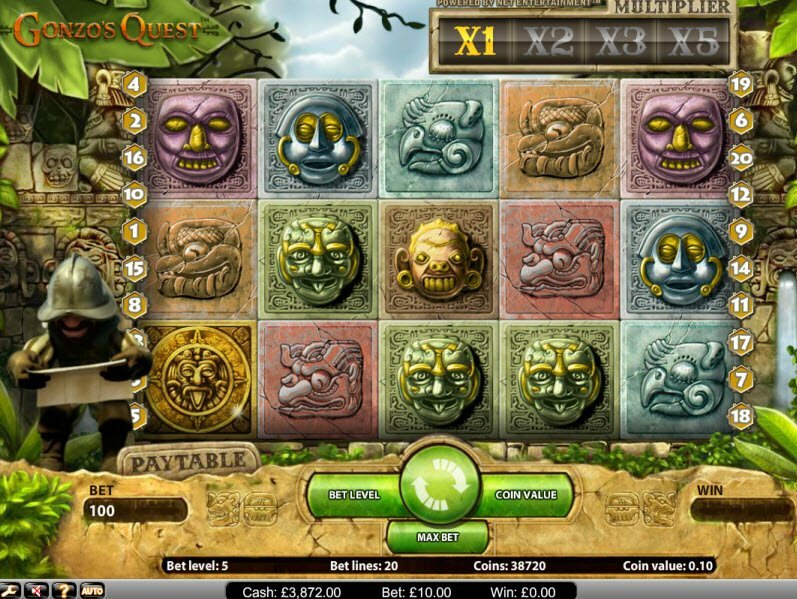 Net Entertainment Gaming Software presents the Gonzos Quest slot machine. 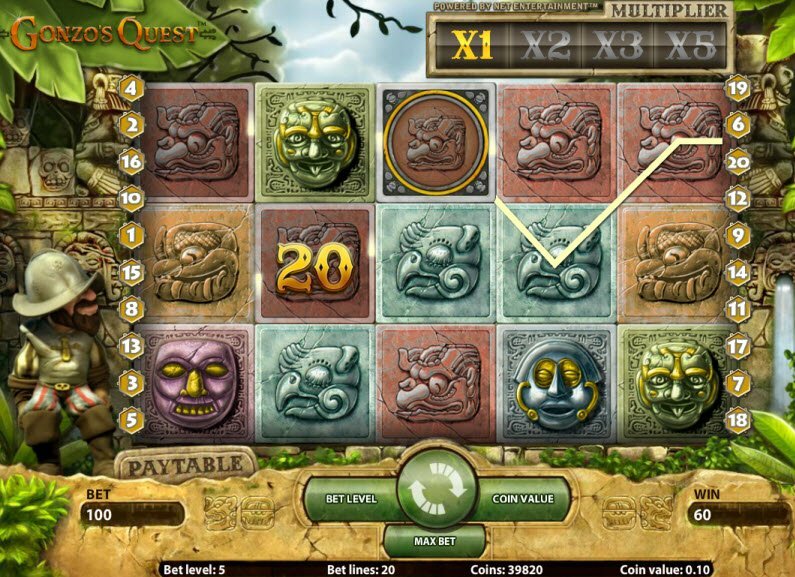 This online casino game takes you to the year 1514 deep in the Amazonian jungles of Peru. Gonzo, a Spanish explorer, leaves his expedition in lieu of his own quest to find El Dorado, The Lost City of Gold. Join Gonzo by spinning the slot reels. You may hit the jackpot and win a city’s worth of gold! The Gonzos Quest Slot Machine features an character based on the Spanish Conquistador, Gonzalo Pizarro. The cool opening intro video tells Gonzo’s story. He jumps ship and starts an expedition alone to find El Dorado, The Lost City of Gold. When you play the game, Gonzo stands beside the reels dressed in armor and observes the game. The game designers did a great job bringing him to life with 3D graphics and animations. The reels themselves feature golden inlaid tile designs inspired by Incan art and mythology. Fountains and tropical plants decorate the outside of the slot machine. While playing the game, a traditional Pan flute accompanies the crystal clear sound effects of tiles smashing. 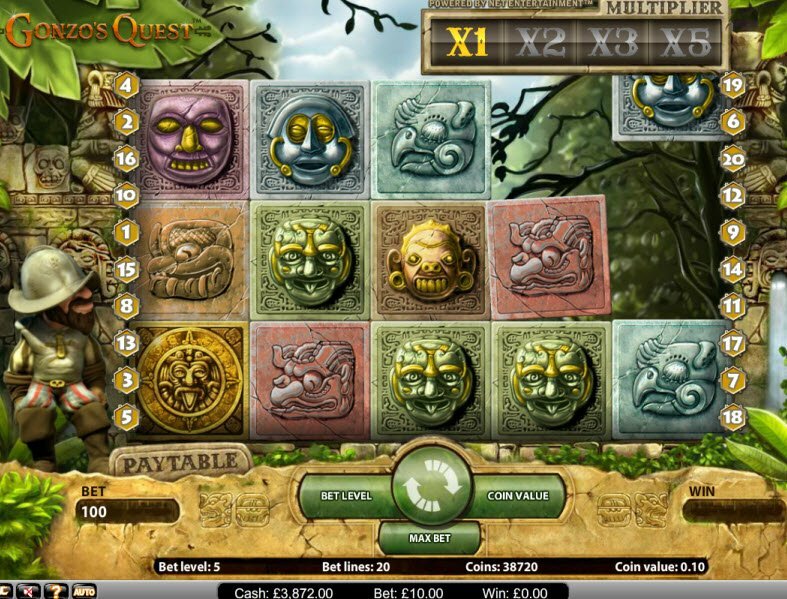 The excellent graphics and sound effects in Gonzos Quest slot game create an exciting and entertaining gaming experience. During winning combinations, the matching tiles explode and allow new tiles to fall down in its place. This feature gives you even more chances at winning all the gold! In Gonzos Quest Slot bonuses, things can get pretty unpredictable. During winning combinations, the matching tiles explode and allow new tiles to fall down in its place. This feature gives you even more chances at winning all the gold! The Free Fall feature activates 10 Free Falls for each bet line containing 3 Free Fall symbols in succession. The game also features Avalanche multipliers that increase with each new Avalanche in a game round. The Wild Symbol tile substitutes for all other symbols.